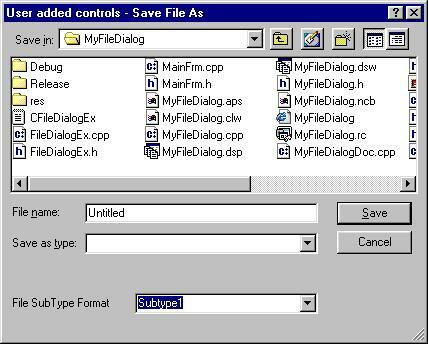 This article explains how to expand the CFileDialog common dialog box. Although there are similar articles elsewhere on the Internet, none of them resolved the problem of adding user controls in CFileDialog in an MFC manner (without hook procedures, which are not encouridged by MFC any more). In this article you'll find a way how to add one static control and one combo box control to CFileDialog standard dialog. The sample code is of no particular use as the problem is general, but briefly explains concept, and what is more important, I am using similar code in my applications. To retrieve information from additional controls, you must override OnDestroy() member function. // Get a pointer to the original dialog box. sprintf(szText, "Document will be saved under "
Comparing this with hook procedures and user-added templates, that I had to prepare in my earlier API samples, this seems to be much elegant. Only problem was bad Microsoft documentation that used "this" pointer instead of parent window (as explained earlier) while creating user controls. Also, you cannot override OnOK() member function in CFileDialog dialog as you can do that in other dialogs. You should check/save data from your controls in OnDestroy() message handler. I included demo project that shows trivial use of CFileDialogEx class, but it should be used only as reference for your own purposes.